Ugh, I hate this kind of news. 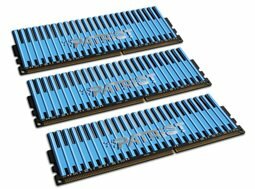 I've just recently upgraded my PC and the motherboard that I've bought only supports DDR2 memory and now companies such as Patriot are releasing Triple Channel DDR3 Memory Kits. Your PC's memory helps speed up your PC's performance and a triple channel DDR3 would definitely do wonders especially if you're doing a lot of video editing. Patriot's tri-channel DDR3 is compatible with Intel's Core i7 and Intel X58 EXpress Chipset and available in an eye-popping 3GB and 6GB capacities.